As I mentioned last week we are back on the road, for a little bit at least. We had to pack up our stuff and then pack it into the truck. So this post is really for Josh….. I hate to admit it but I over pack! There are two good reasons for this, when you know there is a whole semi-tractor’s worth of room for stuff you don’t think, will I really need this. Also we always go out for a week and it turns into three. So now I over pack now. I hate being somewhere and not having the right outfit or having to buy something I don’t really like. Those emergency purchases usually end up at Goodwill sooner than later. Not only do I over pack but I have the world’s largest suitcase. It is nicknamed “The Steamer Trunk” and rarely leaves the truck. Due in part to the fact that it is so heavy; getting it in and out is a very difficult task. Trying to lift it above your head to put back into the trucks loft is NOT fun. Since I’m not a typical traveler I don’t have to follow conventional rules. I pack for more than two weeks and don’t apologize. I also have some formal clothing with us; we never know what is going to come up. There is nothing worse than trying to find a dressy dress in a hurry. Add yes I do need all of those shoes. 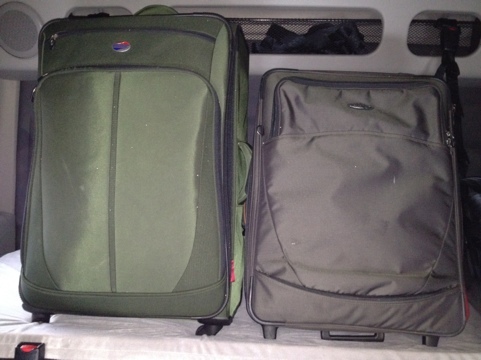 Josh’s normal sizes suitcase next to the steamer trunk. I can fit comfortably inside of mine when it’s empty. This entry was posted in Life on the Road, Travel Life, Travel Tuesday, Work Stuff and tagged Travel Tuesday. Bookmark the permalink. Anita- she does have her own bag, full of toys, food and other supplies. It goes everywhere she goes. We admire you for being able to pack ONLY that much.